Heat oil in a pan and add onions and capsicum. Fry till the onions turn transparent. Then add tomato paste, ginger-garlic paste, chilli powder, coriander powder, garam masala and salt. Add half a cup of water and let it cook in medium heat till the raw smell goes (about 10min). 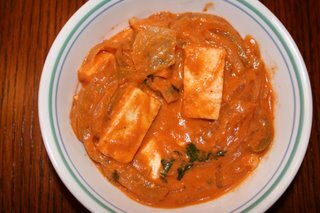 Then add cream and the paneer cubes and let it cook for about 5 min till the gravy thickens. Remove from heat and squeeze half a lemon on top. Coriander leaves can be used for garnishing. This can be served with roti, naan or pulav. I also used this to make an Indianized burrito. capscicum n paneer - yumm. a small piece of info- capscicum, broccoli n cauliflower are good source of fibre. Teaser - paneer made out of skimmed milk hehe. "Paneer-Capsicum Masala" Looks yummy. Thanks for sharing. Paneer and capsicum looks delicious, wish I could taste some..sigh... Thanks Deepz! hey deepz..I am definetly making something out of your recipes this weekend:-)...I am hungry already for yr food..haha and it's 7:30 am..thanks for leaving a comment..